I’m sure you all know where the church stands, but do you know that there was an Anglo Saxon chapel on a site in Daresbury, probably in the corner of Newton Lane and Chester Road? It would have been a wooden structure, so nothing of it remains. A chapelry was founded on the current site in the 12th century. It was a daughter house of Norton Priory and a chapel of ease within the parish of All Saints’, Runcorn – built so that it wasn’t so far for local villagers to go and worship. 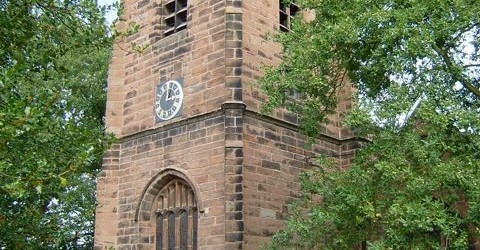 The tower dates from the mid 16th century, but the rest of the church was largely rebuilt in the 1870’s. It is built in red sandstone from the quarry at Keckwick and has a slate roof. There are some beautiful stained glass windows, the most famous of which is the Lewis Carroll window in the Daniell Chapel. The font has an ornate wooden covering given by Lady Greenall and there is a 16th century font in the churchyard where Lewis Carroll was baptised. There is an interesting acrostic in the belfry on the name ‘Daresbury’. We are fortunate that the bells are still rung today and can be heard across much of the parish. Much more specific information is available on Wikipedia, but why don’t you go and have a look at the church yourself? It’s beautiful and such a peaceful place.